Those who own or manage swimming pools know that heating the water can be a major expense. But higher efficiencies and new technologies can bring those costs way down, says Mike Fowler, who leads a tour through the money-saving possibilities in this article. There are two truths when it comes to swimming pools and heat: Year in and year out, some months are colder than others and, year by year, energy prices tend to rise. For a facility built around a heated swimming pool, those two truths are powerful drivers of the ongoing cost of staying in operation – and it’s safe to say that seasonal expenses related to keeping the water warm are never far from the minds of pool owners and managers as the leaves start to turn colors and wintry days approach. It’s an opportune time for watershapers to share detailed information about pool heaters, the way they perform and much how better they’ve become in very recent years thanks to a variety of improvements that result in greater energy efficiency and performance. So far this year in WaterShapes, I’ve written on two occasions about the ways technology has changed the nature of the game and made replacement of pumps (click here) and lighting systems (click here) quite desirable – even if the units being replaced are of fairly recent vintage. In those cases, simple calculations demonstrate the benefits; as we shall see here, the same is true when it comes to heaters. It’s all about efficiency: Older-model heaters, including many made in the not-too-distant past, started out being about 80-percent efficient (or often less). Whatever the starting point, heaters lose a certain amount of efficiency over time as a result of buildup within their heat exchangers and some level of clogging of their burners – and these are situations that only get worse with time. Of course, many of your clients will be unaware of how heaters work or the consequences of their gradual deterioration – so some basic communication is in order. I’d start at square one, defining how the pool pump circulates the pool’s water by drawing it from the pool and pushing it through the filter and then into the heater before it flows back into the pool. Inside the heater, the water flows through a heat exchanger housed within the heater’s combustion chamber, where gas ignites and directly heats the copper or cupronickel tubes of a heat exchanger positioned above the burner tray. This indirectly heats the water as it passes through the copper or cupronickel tubes. Over the course of several hours, a pool’s water is gradually heated to a consistent level as it moves from the pool to the heater and back to the pool again. When the water’s temperature reaches its set point, the heater has done its job and will turn itself off until the water temperature drops to another set point and the heater fires up again. This process, quite simple in both theory and practice, provide quick, controlled heat for a given body of water. At this point, clients will understand how the system works. What they won’t understand right off the bat is how much money they can save (and how quickly) by getting a more modern, more efficient heater. But before you get there, I’d suggest talking about the technology of modern heating – and how the improvements in operating costs can be so dramatic. Technologically speaking, what’s happened with heaters, especially recently, is that manufacturers have all caught up with performance efficiencies required by various rules and government agencies. As a result, new heaters have significantly higher efficiencies (in the range of 85 to 95 percent) than do older models, which performed with efficiencies in the range from 75 to 82 percent. The newer, more efficient heaters burn less fuel to do their work, so energy bills drop immediately. 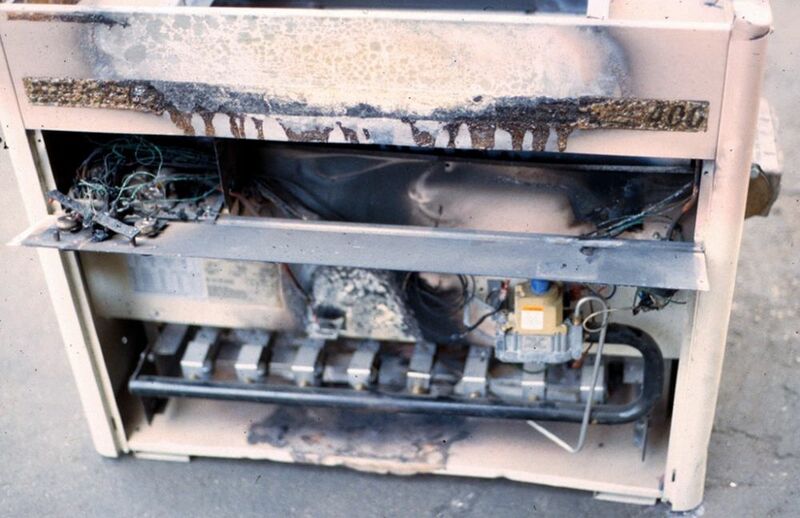 It’s also important to note that an older heater is unlikely to be operating at anywhere near the efficiency it had when it was new: This, as mentioned above, is the result of the buildup of calcium and other minerals in the heat exchanger and the clogging of the burners. In addition, because of the way these units are made today, comparable heaters (with respect to heat output) are physically smaller than they were even ten years ago – a pleasant surprise in a crowded equipment room – and are generally easier to install and maintain. And finally, newer heaters burn their fuel more thoroughly, so emissions are significantly reduced and there’s a strong positive when it comes to local air quality. If a heater looks like this one on the outside (left), chances are good that there’s trouble inside with rust, corrosion and oxidation on the inside. But even if an older-model heater looks relatively pristine to the casual observer, regular wear and tear will limit efficiency – and cost a facility more to operate and maintain. Now that you’ve cleared the conceptual hurdles with the client, it’s time to dive into the numbers and start on a path to explaining the tangible incentives owners have for upgrading to late-model pool heaters. It all starts with British thermal units (or Btus) – a measure of what it takes to raise the temperature of a gallon of water by one degree Fahrenheit. Gas pool heaters are rated by their Btu inputs and outputs, which generally range from 75,000 Btus for a heater used with a small pool on up to 5,000,000 Btus for one used with a large pool. Today’s heaters arrive with efficiencies of 85 to 95 percent, so if you have a heater that is rated 85-percent efficient with a 400,000 Btu input, what comes out of the heater – its output or actual heating capacity – is 85 percent of the total Btus. In the case of that 400,000 Btu heater, an output of 340,000 Btus would result. By contrast, heaters purchased before about 2008 were produced with efficiencies in a range from 75 to 82 percent. Using the example above and assuming an initial efficiency of 78 percent that has dropped off by 13 percentage points (a distinctly conservative estimate), a heater input of 400,000 Btus at what is now 65-percent efficiency would produce a nominal output of 260,000 Btus – and again, that’s probably more than an older heater is typically capable of delivering after six or eight years of use. This revelation about their current heater is not good news for a facility owner or manager, but it’s a phenomenon that, once explained in detail, helps forward discussions about upgrading a swimming pool system with a new, higher-efficiency heater. Through the years, of course, chemical residuals and calcium invariably build up inside the heat exchanger’s copper tubes. Copper is used because it withstands these challenges for a long time, but even with such an ideal material, the process eventually spells trouble in the form of constricted, less efficient flows of water through the tubes. The chief consequence here is that it takes more energy (and greater cost) to heat the water to the desired set point. Reduced water flow is an issue that cuts in a couple directions, depending on the pump the system uses. If the water moves too slowly, efficiency suffers significantly: Ultimately, it will take many more passes through the heat exchanger to reach the set point, so heating cycles are lengthened (and operating costs increased). A pump that isn’t working properly can become a real problem in this context: This is why we now strongly recommend using heaters in conjunction with variable-frequency-drive pumps that tune their performance to the system’s flow requirements. On the flip side, if the water moves too fast through the constricted tubes of the heat exchanger, the water’s contact time with the heating surface is reduced and efficiency suffers here as well. More troubling, this situation can lead to formation of condensation in the system – an issue that leads to even more problems. Propane and natural gas, when burned, produce water as a byproduct. If the heat exchanger is too “cool” because the water is moving too rapidly, the humid flue gases will condense on the fins of the heat exchanger and cause carbon in the ignited gases to adhere to the heat exchanger. The condensate also collects in liquid form – and then drips onto the burners, a form of “rain” that interferes with the flame pattern and ultimately compromises burner performance. 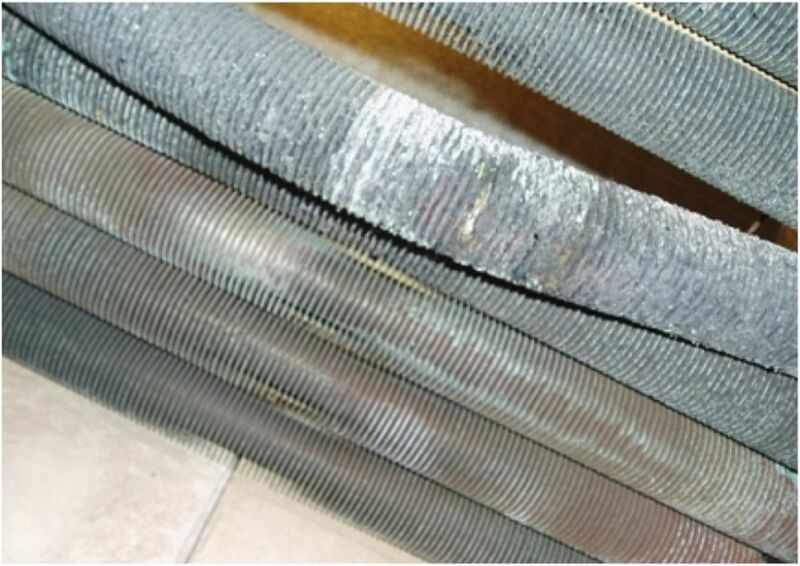 It’s a cascade of performance challenges: Poor combustion results in formation of soot that collects on the fins and impedes the flow of flue gasses. It’s bad enough that this reduces the heater’s efficiency, but it’s worse when you consider that the condensate causes oxidation on the copper surfaces that results in a lowering of water temperatures. Now let’s get down to dollars and cents. As a simple example, let’s look at a small, 20,000-gallon pool and demonstrate the effects of reduced efficiency of an older heater compared to the performance attainable with a new, modern heater. Let’s consider a natural-gas-fueled system (see the sidebar below for an example using a propane system) – and also recall that one Btu is what it takes to raise the temperature of a gallon of water by one degree Fahrenheit. Let us say as well that this 20,000-gallon pool’s water has dropped to 62 degrees and that we want to raise that temperature to 82 degrees – a common target in pools used for swimming competitions. A gallon of water weighs 8.33 pounds, so our 20,000-gallon pool’s water weights 166,600 pounds (20,000 gal x 8.33 lbs = 166,600 lbs). To be heated by 20 degrees, that 166,600 pounds of water will require a heater output of 3,332,000 Btus (166,600 lbs x 20 deg rise = 3,332,000 Btus required). Note that Btus are a measurement per hour. Thus, you need 3,332,000 Btus to raise the water by 20 degrees – or 138,833 Btus per hour (3,332,000 ÷ 24 hrs = 138,833 Btu output per hour). Using the models described in the accompanying text, let’s run the numbers for performance of new and old heaters that run on propane instead of natural gas. One gallon of propane is the equivalent of 92,000 Btus. With 9.8 hours of run time multiplied by a 400,000 Btu input, that’s 3,920,000 total Btus required (3,900,000 ÷ 92,000 Btus = 42.61 gal propane). If a gallon of propane costs $3.00, then the cost to hit the target temperature will be $127.83 (42.61 gal x $3.00 per gal = $127.83). If, with an older heater, it takes 12.8 hours to increase the temperature to the target level, then 12.8 hrs x 400,000 Btus = 5,120,000 Btus required; 5,120,000 ÷ 92,000 = 55.65 gal propane at $3.00 per gal, or $166.95. The number holds steady: It will cost a facility 29 percent more to heat a pool with an older, less efficient propane-fired heater – comparable to the 30 percent hit they take with natural gas. Now let’s return to our original example of a new 400,000 Btu heater with an 85-percent efficiency rating – that is, a unit with an output of 340,000 Btus. At that performance level, it will take 9.8 hours to raise the water temperature in our 20,000 gallon pool by 20 degrees (3,332,000 Btus ÷ 340,000 = 9.8 hrs). As we should all know, gas companies charge by the therm. To figure out how much it will cost us to heat the water for those 9.8 hours, we need to know that 100,000 Btus is the equivalent of a single therm. In 9.8 hours, heating up a 20,000-gallon pool by 20 degrees using a 400,000 Btu, 85-percent efficient heater with a 340,000 Btu output will consume 39.2 therms (hours of heating time multiplied by input Btus and divided by 100,000 – that is, 9.8 x 400,000 = 3,920,000 total Btu ÷ 100,000 = 39.2 therms). Now you factor in the local cost per therm of natural gas – let’s assume a rate here of $1.20 per therm – and the result is a cost of $47.04 to heat the water to the desired temperature (39.2 therms x $1.20 = $47.04) in the indicated 9.8 hour period. Now let’s plug in the numbers with an older, five-to-seven-year-old heater rated originally at 78-percent efficiency but now performing (optimistically) at a 65-percent level – that is, with an output of 260,000 Btus: 3,332,000 Btus required ÷ 260,000 = 12.8 hrs; 12.8 x 400,000 = 5,120,000 Btus; 5,120,000 Btus ÷ 100,000 = 51.2 therms; 51.2 therms x $1.20 = $61.44. By comparison to the $47.04 derived here, the facility is spending 30 percent more than it needs to in getting its water to the desired temperature. That translates to a 30 percent savings in heating costs across the entirety of the cold-weather months – and in some cases that can be an eye-popping number. By any reckoning, that 30 percent savings in gross heating costs should be enough to grab a facility owner or manager’s attention. Now it’s time to focus on the specifics of the pool at hand – indoor or outdoor? how much water? – and start discussing a unit that’s the best possible match for the task at hand. Start by determining the desired water-temperature target, which is generally at or around 82 degrees Fahrenheit. If the pool is outdoors (but even if it’s indoors in an inefficiently heated space), determine the average ambient temperature for the coldest months of operation. The difference between the 82-degree target and the lowest ambient temperature will let you know the temperature rise that will be required. A new heater looks better, of course, but late-model versions also work better because of various improvements in technology, materials and efficiency – including modern ignitions systems (left), cupronickel heat exchanges (middle) and simplified access (right). They’re also set up for easy operation, which simplifies maintenance and limits the sorts of operator adjustments and tinkering that could affect the performance of past generations of heaters. Armed with this bit of information, you can recommend a heater with Btu specifications that are appropriate for the pool. If a 30-percent saving in ongoing energy costs isn’t sufficient to incline your client toward upgrading the heater, especially one that’s more than about ten years old, there are other points to make in communicating about the value of newer technology. First, new heaters have lower emissions of nitrous oxides, a major contributor to air pollution and generally a key community issue. Second, new heaters are low-maintenance items that essentially take staff tinkering out of the equation once the set points are dialed in. Third, modern heaters’ internal systems are improved over past models, so condensation is less of an issue than it once was and the units perform better through longer service lives. Finally, modern heaters are safer. Many now have sealed combustion chambers, thereby limiting exposure of a source of ignition to chemicals and other materials that might be stored in proximity to the heater. 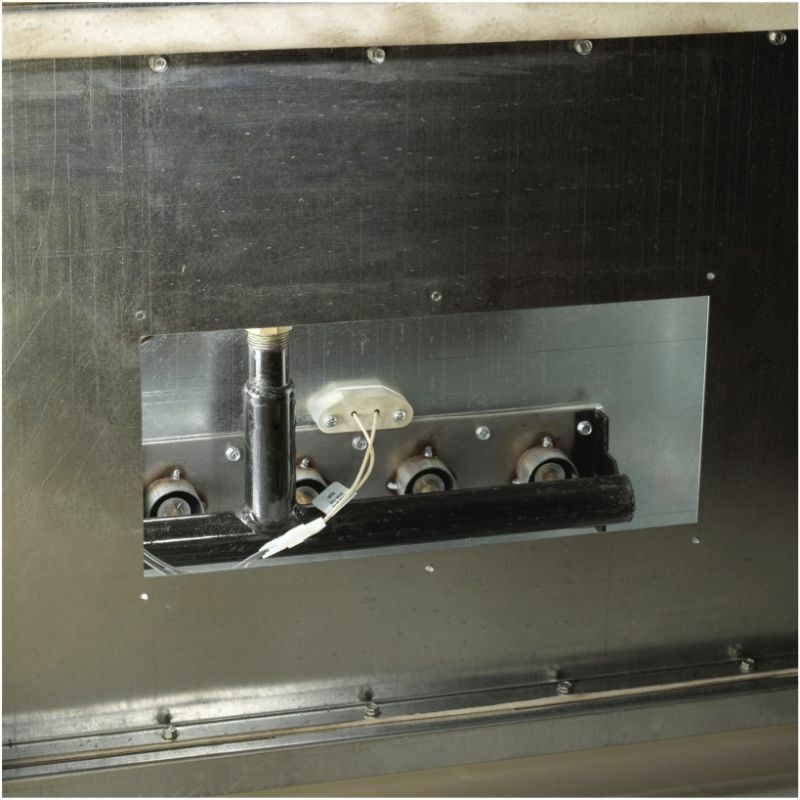 Venting systems have been improved as well, further isolating the burner from its surroundings. It’s an impressive combination of new technologies and efficiencies compared to old-school approaches that cost more to operate and maintain in an environment where those costs are invariably rising. In this context of lower ongoing energy costs, easier maintenance and increased safety, new heaters just make sense.